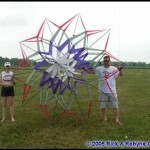 On the third weekend in July for the past twenty years kite fliers have been gathering at Maumee Bay State Park, just east of Toledo Ohio for the largest kite festival in the Midwest USA. 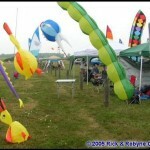 The “Games” are a Camp Out Kite Fly and most of this years 150 participants camped at the State Park. 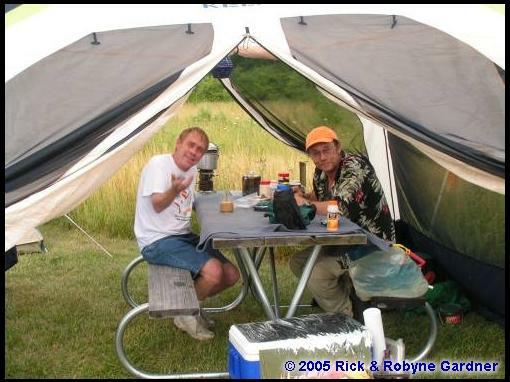 Although officially the event took place on July 16, 17 many of the fliers “lived” at Maumee Bay for a week or more! 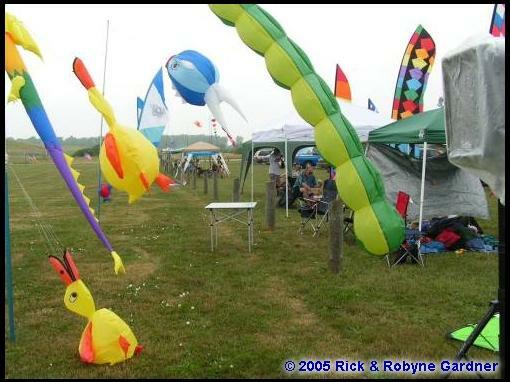 The North Coast Games are pretty unique as kite festivals go. There’s no schedule of events. We don’t host any “official” competitions. And we always try to avoid that “Bad O word” (Organization) This year we were “blessed” with five inches of rain in less then an hour and it only slowed the festival for a little while. We had 90 degree heat much of the weekend and fliers hit the fields anyway! We held our “Saturday Night Dinner and Auction” under the Big Tent during a downpour that made Noah’s flood look like a sprinkle. Not a one flier left, not one! 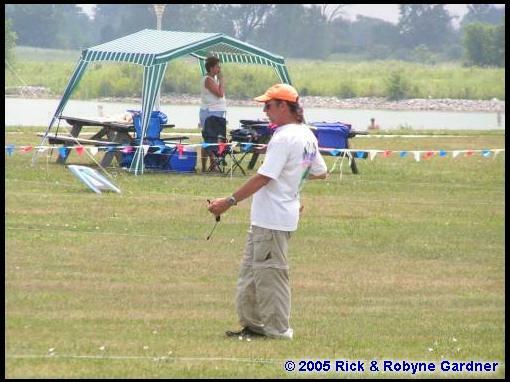 The “Games” are held on one very large field about 1/4 mile from Lake Erie. 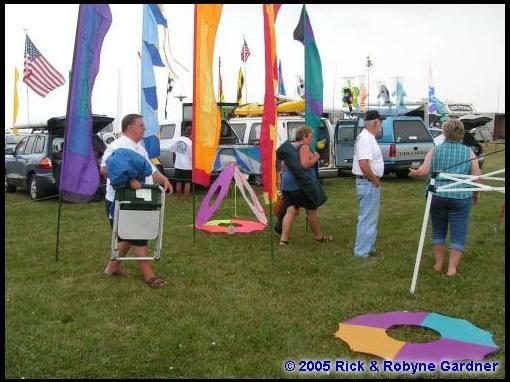 At any time throughout the event weekend you can find single line fliers, dual and quad line fliers, traction kite fliers, fighter kite fliers, ALL types of kite fliers intermixed and mingled out on that one field all at the same time. So what do you write about an event that’s twenty years old? What happens at the festival that brings people back year after year? 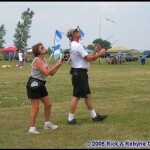 Despite the name North Coast STUNT Kite Games,” kite fliers of all persuasions make the trip to Maumee Bay State Park. 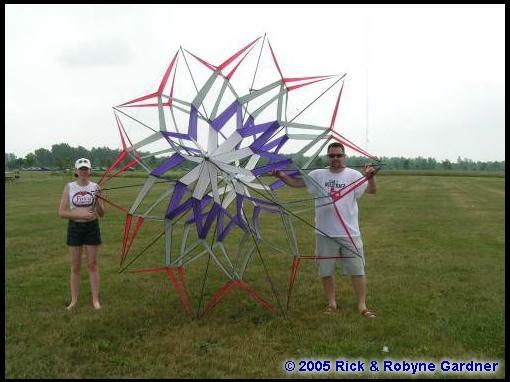 Chris Taylor brought his huge handmade cellular snowflake. Lee Sedgwick brought a really big bag of his latest creation, the UFO. 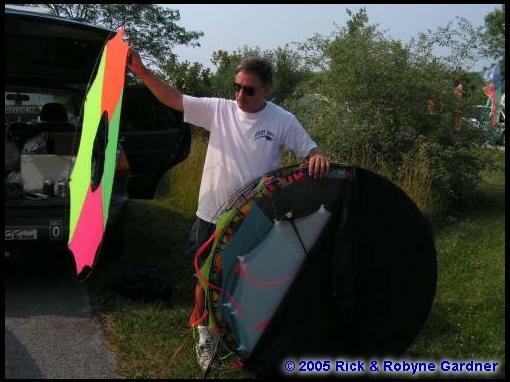 Nancy Lockwood and Harry Gregory set up a very informative “Kite History Display.” AKA Regional Director Tom Brailey arrives to promote the AKA when ever he finds the chance. 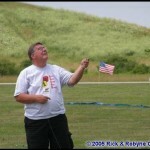 Charlie Sotich, a regular at the Games, always brings out his “very small” bag of little kites. 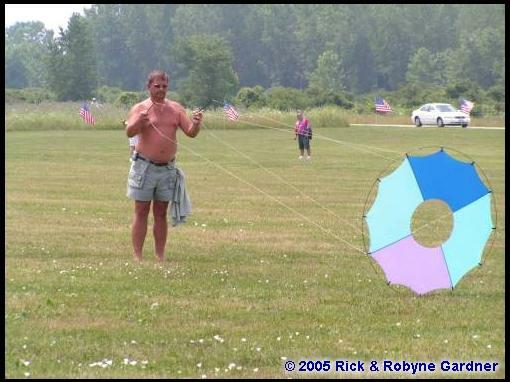 Rick and Robyne Gardner along with Vicki and Dean Proudfoot add to the field of kites with their pairs kite flying. Kevin Kilgoar (current commandant of the host club the Black Swamp Air Force) always seems to have something up his sleeve to make the event more enjoyable and exciting. Or Vern Balodis who seemed to be everywhere taking pictures and flying Rev’s. Terry (Gizmo) Gerwick (current “Keeper of the Official Camp Fire”) arrives with a very full truck load of toys, gizmo’s and gadgets for the weekend, as well as a few “Fire Toys”. 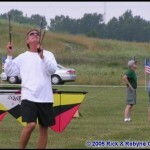 The Gibson’s always fly more kite trains than anyone believes possible. Or Kathy Armstrong who keeps things running smoothly under the “Big Tent” throughout the weekend! 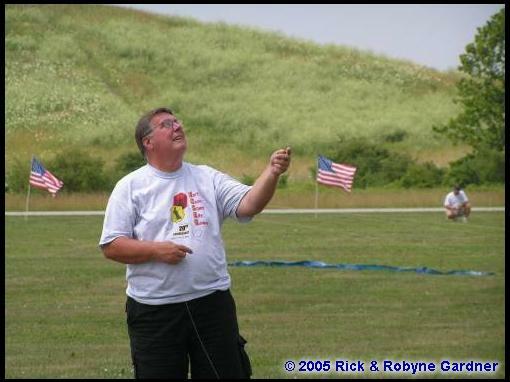 Then there’s John Pfister who keeps the “spectators” supplied with kites to fly if they haven’t brought any along! 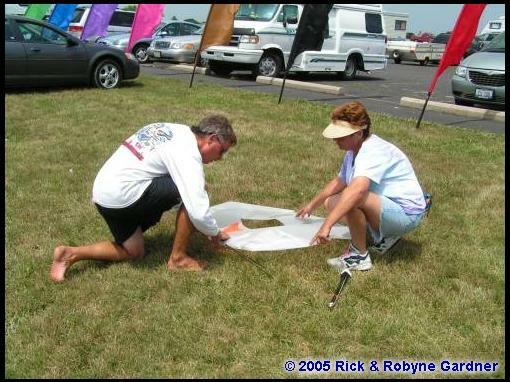 Sorry to all, but I can’t even begin to list everyone who contributes to the North Coast Stunt Kite Games and its twenty year birthday. AND my apologizes to anyone that I have not listed of the 130 other fliers who make this an event worth attending. 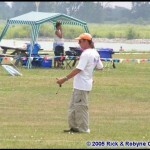 If it isn’t about Kite flying, then what is it? 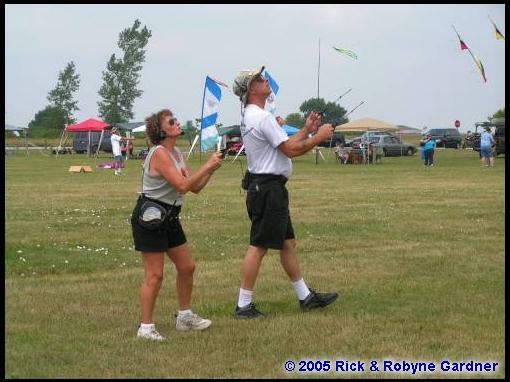 As far as I’m concerned, the main reason that the North Coast Stunt Kite Games has lasted so long is because of the People that attend this event year after year. Each individual brings a little bit of themselves to this event. Each of us that comes to the “Games” takes home a little part of every other flier that calls this event their own! The Games are so successful simply because we try not to be too “Organized” and kiddingly say that’s a dirty word! That is not to say that there isn’t a lot of organization required for a festival that attracts over 150 fliers year after year. We all just work very hard to “hide” that organizational effort. And just like the real “Woodstock,” anything can and frequently does happen at the Games. 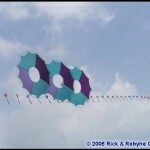 If you want to attend a really great kite festival where you don’t have to “rush” through a tight schedule. 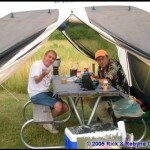 If you want to fly kites at a night fly for FIVE nights right out of your camp site. 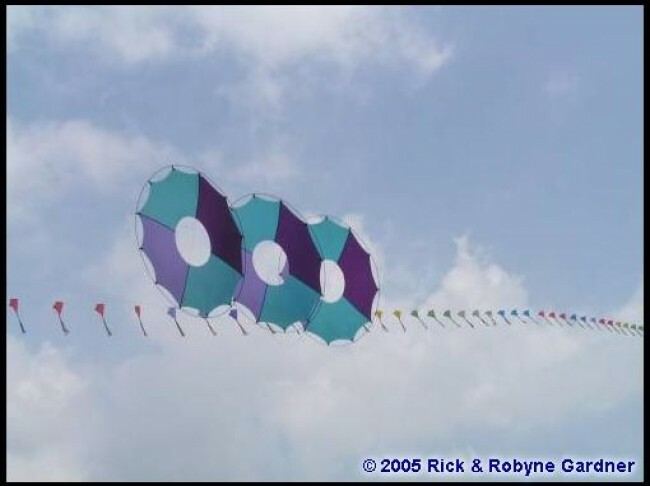 If you want to fly ANY kind of kite on the field at the same time as EVERYONE else without flags and fences in between. If you want to hang out with 150 of the GREATEST kite fliers in the World then the North Coast Stunt Kite Games are for you! For more info about “The Games” contact Kevin Kilgoar, Commandant of the Black Swamp Air Force at the BSAF website. 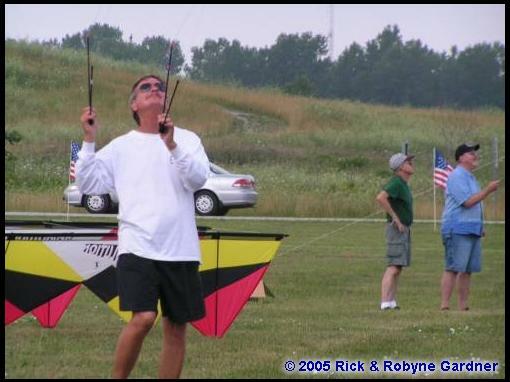 The Three Blind Mice were the original “founders” of the North Coast Stunt Kite Games in 1985 Fred Bell, Steve (Uncle Wilbert) Weber, and myself. 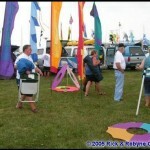 This entry was posted in 2005, Events / Festivals, Issue 43 (Jul/Aug), KL Archive, Reports and tagged festival, ohio, sport kite.